Harvard Business School Press, 9781422133316, 247pp. Most companies treat service as a low-priority business operation, keeping it out of the spotlight until a customer complains. 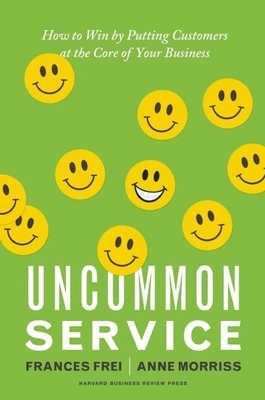 Then service gets to make a brief appearance - for as long as it takes to calm the customer down and fix whatever foul-up jeopardized the relationship. - How do customers define "excellence" in your offering? Is it convenience? Friendliness? Flexible choices? Price? - How will you get paid for that excellence? Will you charge customers more? Get them to handle more service tasks themselves? - How will you empower your employees to deliver excellence? What will your recruiting, selection, training, and job design practices look like? What about your organizational culture? - How will you get your customers to behave? For example, what do you need to do to get them to treat your employees with respect? Do you need to make it easier for them to use new technology? Frances Frei is UPS Foundation Professor of Service Management at Harvard Business School, where she developed the school's successful Managing Service Operations course. Anne Morriss is the Managing Director of the Concire Leadership Institute, a consulting firm that helps leaders to surface and remove performance barriers.